Iowa Work Injuries - How Can This Be Happening to Me? Often injured workers wonder, how can this be happening to me? Take for example, Karen, one of my clients. Karen, a 35-year-old wife and mother of three, worked in a factory. Karen was a dependable worker who always came to work on time and had not missed a day of work in 4 years. Unfortunately, Karen was lifting a heavy part at work when her back gave out. She ended up on the floor in severe pain. Karen immediately went to medical personnel at the factory and reported that she had hurt her back at work. The medical personnel told her to go see her family doctor and return to work with what he says. Karen's family doctor prescribed pain medications and excused her from work for the next week. However, Karen's condition worsened and after only two days she was back seeing her family doctor. Her doctor ordered an MRI, which confirmed that Karen had suffered a herniated disc in her back. Karen was referred on to a surgeon for evaluation of the herniated disc. The surgeon told her that surgery was her best option as the disc would likely not heal on its own. Karen was devastated because she had never had surgery before and had always taken pride in her work. While Karen had the surgery and made a good recovery, the doctor assigned her a 10% impairment rating and placed a permanent 30-pound lifting restriction upon her. She was not able to return to her higher-paying line job, and had to take a lower paying job. She was satisfied with the 50 weeks of benefits they paid her, but did not realize that she was entitled to much more compensation for her injuries. Thankfully for Karen, one of her friends had previously been injured at his job and I handled his case for him. Karen came to see me and I informed her that her case was worth much more than the 50 weeks of benefits she had been paid. She was entitled to industrial disability for which her impairment rating was only one of many factors. Karen eventually settled her case for more than twice as much as the insurance company had previously paid her. If Karen had not come to see me, she would have missed out on more than $50,000 in money owed to her. Iowans hurt at work often do not know what their basic rights are. I can provide injured employees who have an Iowa workers' compensation claim with information about their rights under Iowa's workers' compensation laws, including what benefits they should receive, how their weekly check is calculated and much more. 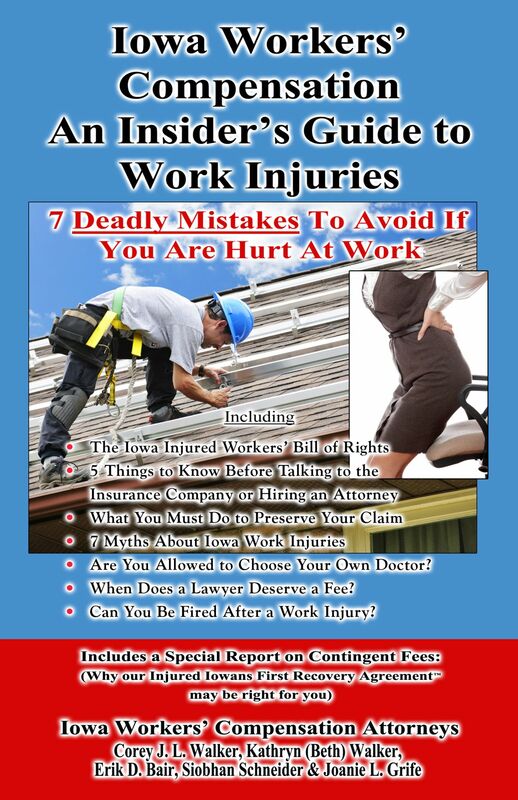 To learn more, including the 7 Deadly Mistakes to Avoid if You are Hurt at Work, order your copy of my FREE book by clicking on the work injury book image, visiting www.IowaWorkInjury.com or Calling Now (800)-707-2552, ext. 811 (24 Hour Recorded Message). Why offer a Free Book? Since 1997, I have represented hundreds of Iowans hurt at work from Newton, Des Moines, Grinnell, Knoxville, Iowa City, and throughout the state of Iowa. I have seen too many clients make mistakes before they had the "right" information, resulting in them losing thousands of dollars. Get help with your claim now.